If your air conditioner went out or can’t keep up with your home’s current cooling demands, it’s time to call your local HVAC company, T.E. Spall & Son for air conditioning repair. If something unusual is happening with your air conditioner, it’s best to call for AC repair as soon as possible—putting it off could result in more damage and even more expensive AC repair later. Water Leaks. If there is water leaking from your air conditioning unit, the problem could be as simple as a dirty filter or it may have to do with the condensate drain or pan. Unusual Noises. If you hear banging, clanging, popping, squealing, or unusual sounds coming from your air conditioning system, this is something you will need to have checked out right away. 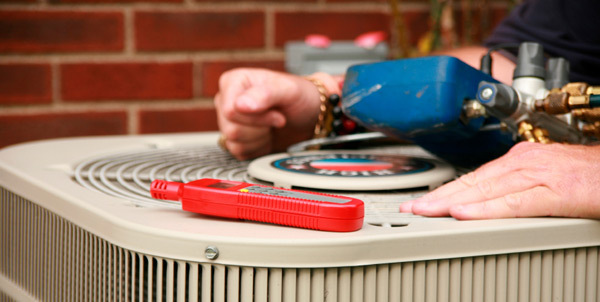 Unusual sounds can signal safety issues, which require immediate AC repair. High Energy Bills. A large spike in your energy bill is a sign that your air conditioning system is not working effectively. You might just need an air conditioning tune-up, however, leaving your AC system to its own devices can continue to be a costly exercise. AC Won’t Turn On. If your air conditioner won’t turn on at all then you are likely aware that there is an issue. T.E. Spall & Son can provide fast, reliable AC repair in Scranton and throughout Northeast PA so you don’t have to suffer through the hot days! Blowing Warm Air. If your air conditioning system starts blowing warm air this could be due to frozen AC coils. Turn it off and let it sit for two to three hours. If you switch your system back on and it is still blowing warm, call us for AC repair. Ready to schedule your air conditioning repair? Call us today! We even provide 24/7 emergency AC repair in Scranton and Northeast PA for when your system breaks down unexpectedly. T.E. Spall & Son offers a full range of air conditioning services, including AC repair in Scranton and surrounding areas. With over 30 years in the business, we have a reputation for reliable HVAC services alongside great customer service. We are dedicated to bringing the best in HVAC services to Northeastern Pennsylvania. If your air conditioning unit is not working to keep your home comfortable, contact T.E. Spall & Son today for the best in AC repair in Scranton with the highest level of knowledge and workmanship in Northeast PA!